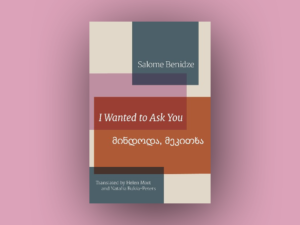 I Wanted to Ask You, Salome Benidze, translated by Helen Mort and Natalia Bukia-Peters, the Poetry Translation Centre, 2018. It was morning and the sun slept with me. Morning, and the moon’s ghost was our guard. darker than ice but just as hard. It seems that the only purpose of this change is to rhyme with ‘guard’. ‘The Story of Those Without Motherland’ is much more interesting, and here the collection gathers energy. What starts as a didactic and patriotic poem turns into a more nuanced take on nostalgia for one’s homeland. At first we are told that ‘the happiest death is | death in the mountains of your country | and the worst is death under a different flag’, but then comes the admission that ‘I have never had a home | and the torrent from the mountain sweeping down the street | is just tears | which I saved for my stepmother’. ‘[M]y land […] did not accept me: | it buried me | and when I lay too heavily | it spat me out’ – by the end of this longer poem, the opening delusions have all been seen through, and the bitterness is palpable. The highlight of the collection is ‘The Story of Flying’, a coming-of-age poem, achingly beautiful, about girls as they are and how they fly when they are in love. because there’s nothing to hide. They are as simple as crocuses. that earth is sometimes more important. Their faces don’t launch a thousand ships. The poem is a love letter to girls, who ‘don’t even understand how they rise, | high, towards the full moon’, who have magic and power and yet sometimes crash on the rocks, following the ‘one simple rule: not all flights are for survival.’ The male friend in the poem does not understand this rule, wants everything to be wrapped up neatly – he believes in ‘the power of safety regulations | the power of happy endings’. Still, Benidze’s girls and women seem fragile things that hang on threads of love, and crash when the threads are broken. I love it like I love the smell of your rough skin. Adham Smart is a writer and translator from London. He was featured in The Salt Book of Younger Poets, and contributed as translator to Six Georgian Poets (Arc Publications). His first book of poetry, yes yes mouth (Valley Press), and his first full-length translation from Georgian, All the World’s Mysteries by David Dephy (MadHat Press), are both forthcoming.